EARLY PLANNING AND DEVELOPMENT: Robert Moses, the new commissioner of the Long Island State Park Commission (LISPC), envisioned a network of parkways to connect New York City with new and proposed state parks on Long Island. The parkways proposed by Moses were planned to be "ribbon parks" that would not only separate the roadway from neighboring communities, but also serve as an extension of the main parks. Soon after he assumed the LISPC post in 1924, Moses discovered an undeveloped strip of land that had been bought by the city of Brooklyn that ran all the way out to Suffolk County. Prior to the consolidation of New York City in 1898, Brooklyn imported its drinking water from the Island's aquifer and piped it along what is now Conduit Boulevard to a reservoir in Ridgewood. After merging with Manhattan, Brooklyn abandoned its Long Island wells but continued to maintain the right-of-way. This right-of-way was to be used for the proposed Southern State Parkway. In those days, we were only a few years beyond the old standard three-rod road of the pre-auto age. Ten feet were enough for a lane. Four lanes were ample. That's forty feet. Twenty in the middle makes sixty, and fifty on either side was considered adequate for landscaping. More was extravagant and invited criticism. One of my associate state park commissioners, Townsend Scudder… who was familiar with every inch of the way, said that 160 feet for a parkway right-of-way was plenty. I insisted on more. I was supported by Clifford Jackson, the other commissioner. (We) were great friends, and the matter of a few more feet caused no bitterness. So we spread out to 250 feet, then 300 feet, and finally as we went east as much as 400 feet. The original pavement was a single 42-foot-wide, four-lane undivided pavement -- two 10 ½-foot-wide lanes in each direction -- on an 80-foot-wide right-of-way. New highway engineering advances, such as grade separation and cloverleaf interchanges, were incorporated into the design of the initial section. A state police substation and barracks were constructed on either side of the parkway in North Valley Stream. To get around Hempstead Lake, crews constructed a route around the western, southern and eastern perimeter of the lake. Construction on the first section of the Southern State Parkway between EXIT 13 (Central Avenue) and EXIT 19 (Peninsula Boulevard) began in 1925. This initial section opened in 1927. Two years later, a second section opened east to EXIT 27 (Wantagh State Parkway) to coincide with the opening of Jones Beach State Park. At this time, Governor Franklin D. Roosevelt recommended a western extension of the Southern State Parkway to Brooklyn. (This extension evolved ultimately as the Belt Parkway.) An extension of the initial stretch of parkway west to the Belt-Cross Island interchange opened in 1940. EXPANDING IN LENGTH AND WIDTH: In 1930, Nassau County provided extra land to the Long Island State Park Commission to widen the average right-of-way along the Southern State Parkway to 250 feet. By 1932, the Southern State Parkway reached the Nassau-Suffolk border, ending at EXIT 32 (NY 110) in North Amityville. This section continued the undivided four-lane roadway design. Continuing east into Suffolk County, the Southern State Parkway took on a more advanced design: two 25-foot-wide roadways, separated by a ten-foot-wide grassed median. The parkway extended to EXIT 33 (NY 109) in 1939, EXIT 38 (Belmont Lake State Park) in 1940, EXIT 39 (NY 231-Deer Park Avenue) in 1947, and reached its originally planned terminus at EXIT 41 (CR 57-Bay Shore Road) in 1949. In 1962, the Southern State Parkway was extended east of this location as the Heckscher (Spur) State Parkway. DESIGN CHANGES (1945-1963): As one of the pioneer limited-access highways in the United States, the Southern State Parkway received many changes and improvements over the years. Some of these were a result of improvements in highway design, while others were brought about by the changes in traffic patterns. The explosive postwar growth of the late 1940s and 1950s changed the purpose of the parkways: they were to serve the new residential, commercial and industrial areas of Nassau and Suffolk counties. To meet these new demands, the Southern State Parkway had to change. In 1947, the circuitous routing around Hempstead Lake (between EXIT 18 and EXIT 19) was abandoned, and was replaced by a more direct route constructed on earthen fill. This section was left abandoned - complete with the original timber lightposts - until 1957, when the eastern part of the perimeter route was taken over by the Nassau County Department of Public Works for an extension of Peninsula Boulevard (Nassau CR 2), and was modernized into a four-lane divided boulevard. The increased volumes of traffic and the increased vehicle operating speeds called for physically separating opposing traffic streams. Between 1948 and 1950, a 15-inch-high concrete barrier was installed down the center of the undivided four-lane roadway through Nassau County to separate the eastbound and westbound lanes. However, this proved only a temporary solution. Beginning in 1954, and continuing through 1963, construction crews built a new roadway separated from the original by a variable median. However, it was not as simple as adding a roadway parallel to the existing one. Engineers used the original underpasses for the westbound lanes in some locations and the eastbound lanes in others, and in the process gave the parkway a slightly straighter alignment. The two roadways now provided a total of eight lanes between the Belt-Cross Island interchange and EXIT 18 (Eagle Avenue), and six lanes between EXIT 18 and EXIT 41A (Sagtikos State Parkway). The Jones Beach State Parkway Authority financed the $14 million parkway expansion project. Ever notice the stairway in the center divider that is part of the stone overpass while heading east on the Southern State Parkway at EXIT 15? Pedestrians walking from the north side of the parkway to the south side (leading to Valley Stream State Park) in the days apparently used the stairway before the parkway was four lanes in each direction. DESIGN CHANGES (1977-PRESENT): In 1977, maintenance of the Southern State Parkway was transferred from the LISPC to the New York State Department of Transportation (NYSDOT), although ownership remained under the jurisdiction of the New York State Office of Parks, Recreation and Historic Preservation (NYSOPRHP). To accommodate the increase in traffic volume and speed, and to address the accident history, the NYSDOT began to modify the parkway in accordance with federal and state traffic safety guidelines. Such improvements made to increase operational safety included the installation of three-foot-high concrete ("Jersey") median barriers, steel guardrails and sand-filled impact attenuators. In July 1978, one year after the NYSDOT took over maintenance of the parkway from the LISPC, the Valley Stream tollbooths located between EXIT 13 and EXIT 14 were removed. This closure came after a 20-year battle for their removal, and three years after a toll hike from 10 cents to 25 cents that angered parkway users. When signs were posted crediting Democratic Governor Hugh Carey for the removal of the booths, Long Island Republicans, who lobbied many years for their removal, were incensed. Before the NYSDOT took over the maintenance of the parkways, the parkway section from the Queens-Nassau border east to EXIT 28 (Wantagh Avenue) received new lighting and signs. However, the new exit and destination signs featured white lettering on a brown background, not the MUTCD standard of white-on-green. The rationale here was that since the parkway right-of-way was technically within a state park and administered by the LISPC, brown-on-white signing was permissible. (A few exit and destination signs at the Meadowbrook State Parkway and the Wantagh State Parkway interchanges featured black lettering on a white background.) This situation was rectified after the rest of the parkway received new MUTCD-conforming signs and lighting in the late 1980's. THE ABANDONED: The LISPC constructed a median service station on the parkway just east of EXIT 32 (NY 110) in North Amityville under the original construction contract in the late 1930s. The stone-arch overpass carrying Great Neck Road (Suffolk CR 47) over the parkway was incorporated into the service station. The station was closed in 1985, but evidence of the station remains in the form of abandoned ramps in the median. ADDRESSING CURRENT AND FUTURE NEEDS: Despite the improvements, portions of the Southern State Parkway remain congested and dangerous. 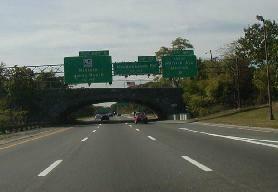 One section in Nassau County is nicknamed "Blood Alley" for its sharp curves, short acceleration and deceleration ramps, the profusion of smaller exits, and the close proximity of three intersecting north-south highways (the Meadowbrook State Parkway, the Wantagh State Parkway, and the Seaford-Oyster Bay Expressway). The NYSDOT extended the INFORM electronic traffic information system to the Southern State Parkway, longer acceleration and deceleration lanes, and reconstruction of major interchanges. The $4.7 million extension of the INFORM system to the Southern State Parkway was approved in the 1998 Federal highway act. The NYSDOT allocated $23 million to extend acceleration-deceleration lanes, reconstruct exit ramps and make other safety improvements. In conjunction with a Suffolk County project to widen Wellwood Avenue, the NYSDOT is widening the overpass at EXIT 35 (Suffolk CR 3). The $5 million project was completed in 2008. Work began in July 2008 on a $13 million project to resurface 10.5 miles of the parkway between EXIT 21 (Nassau Road) in Roosevelt and EXIT 33 (NY 109) in Farmingdale. The project was completed in 2009. Work is expected to begin sometime after 2010 to rebuild the Southern State Parkway in the area of the Meadowbrook State Parkway interchange. These improvements, which are expected to cost $69 million, should help improve traffic flow and enhance safety on both parkways. Long-range plans call for the construction of an additional travel lane in each direction along the Southern State and Heckscher State parkways east to EXIT 44 (NY 27 / Sunrise Highway). The two new lanes, which would be set aside for HOV use during rush-hour periods, are expected to handle the new "Long Island Rapid Commute" (LIRC) vehicles envisioned by the "LITP 2000" plan. The LIRC articulated vehicles would travel on dedicated new and existing HOV lanes on controlled-access highways, as well as on existing arterial roads. According to Parsons Brinckerhoff, the consulting engineers for the plan, approximately 50 parkway overpasses would have to be reconstructed to accommodate the LIRC vehicles. ABOUT THE EXIT NUMBERING: Why does the exit numbering on the Southern State Parkway begin at EXIT 13 (Central Avenue)? Originally, the Southern State Parkway continued the exit numbering scheme of the Cross Island Parkway. The sequential numbering scheme began at EXIT 1 (Whitestone Parkway-Whitestone Bridge) and continued to EXIT 12 (Laurelton Parkway-Belt Parkway) before continuing along the Southern State Parkway. It was not until the late 1960s that the Cross Island Parkway adopted the numbering scheme of the Belt Parkway. AN EXTENSION TO MONTAUK POINT: In 1936, the Regional Plan Association recommended the construction of an expressway and parkway network covering the entire New York metropolitan area. One proposal in this network called for the extension of the Southern State Parkway along the route of the Heckscher State Parkway east to Islip Terrace, then on new right-of-way east to Montauk Point. The proposed eastern extension of the Southern State Parkway was never officially mapped by the LISPC. However, it may have considered by the LISPC as a long-range proposal, since it would have connected to the William Floyd Parkway and (unbuilt) Ponquogue Causeway, as well as to Hither Hills and Montauk Point state parks. The Southern State Parkway and Heckscher State Parkway should be widened from six to eight lanes east to EXIT 44 (NY 27 / Sunrise Highway) in East Islip, in accordance with the "LITP 2000" plan. In conjunction with the widening project, interchange improvements should be made where appropriate, particularly at EXIT 22 (Meadowbrook State Parkway), EXIT 27 (Wantagh State Parkway) and EXITS 28 A-B (NY 135 / Seaford-Oyster Bay Expressway). Collector-distributor (C/D) roads also should be built where appropriate. For the most part, the parkway works fairly well in Suffolk County, except at the NY 110 and NY 109 interchanges. In Nassau County, the area from the Meadowbrook State Parkway to the Seaford-Oyster Bay Expressway (NY 135) is the greatest problem area due to the large traffic flow at the three major interchanges. Some minor changes could ease some traffic such as exiting from an exit only lane and the right lane as we do at the LIE-135 interchange. If widening of the parkway were to occur, I would like to see a six-lane main roadway and collector-distributor roads in the area to deal with the volume of entering and exiting the parkway, especially from NY 105 to the Meadowbrook Parkway as a phase I project. Some minor relocations of exits may have to happen, especially in the area of the Meadowbrook State Parkway (EXIT 22) and Meadowbrook Road (EXIT 23), where there is limited distance between entrance and exit ramps. The current overpass structures could survive this plan if new arches were to be added on both sides of the existing structures. You would end up with a road similar to the Southern State Parkway interchange between the Robert Moses Causeway (EXIT 40) and the Sagtikos State Parkway (EXIT 41A) as you travel westbound. At this location, through traffic does not have to interfere with traffic entering or exiting at Robert Moses Causeway. The local lane-express lane configuration would be 2-3-3-2. SOURCES: "Freeways Are Now Urged," The New York Times (12/13/1936); Arterial Progress 1959-1965, Triborough Bridge and Tunnel Authority (1965); Public Works: A Dangerous Trade by Robert Moses, McGraw-Hill (1970); The Power Broker by Robert A. Caro, Vintage Books-Random House (1974); History of the Long Island State Parkway System, New York State Department of Transportation (1985); Robert Moses: Single-Minded Genius by Joann P. Krieg, Heart of the Lakes Publishing (1989); "Road to Ruin: Southern State, LI's Oldest Highway, Has Become Its Worst" by Adam Z. Horvath, Newsday (9/03/1993); "Evolution of a Highway" by Bill Davis, Newsday (3/21/1998); "Transit Bill Paving Way for Overdue LI Projects" by Ellen Yan and Elaine S. Povich, Newsday (5/19/1998); "Getting in Last Coin Toss for the Road" by Daniel Goodrich, Newsday (10/24/1999); "Traffic Alert: Delays on Southern State Parkway," WCBS-TV (7/28/2008); New York Metropolitan Transportation Council; Dave Block; Russ Blau; Daniel T. Dey; Fred Hadley; Ralph Herman; Larry Lucchetti; Nathan W. Perry; Jim Wade. Southern State Parkway shield by Ralph Herman. Southern State Parkway exit list by Steve Anderson.